I think that title is a bit misogynistic, but I'm just encouraging you to experiment! One of the qualities that I admire in Zach is his creativity in the kitchen. One night I asked him to make me a sandwich & he came back with a wonderful beef, noodle, peanut sauce concoction that I died over...it wasn't a sandwich at all! He simply looked in the fridge, saw that we had deli sliced roast beef, Bangkok Panang Peanut Sauce (that I love to put on everything! ), & left over fettuccine noodles and used that as a base to put together a wonderful little dinner. We always have a bunch of different sauces, mixes, & random, obscure ingredients on hand & Zach is a master of mixing them. One of my favorite dinners from last week, besides that amazing peanut sauced deliciousness, was a baked salmon that he put together. We found a skinless salmon filet at the grocery store & decided to try something out for a Sunday night dinner. 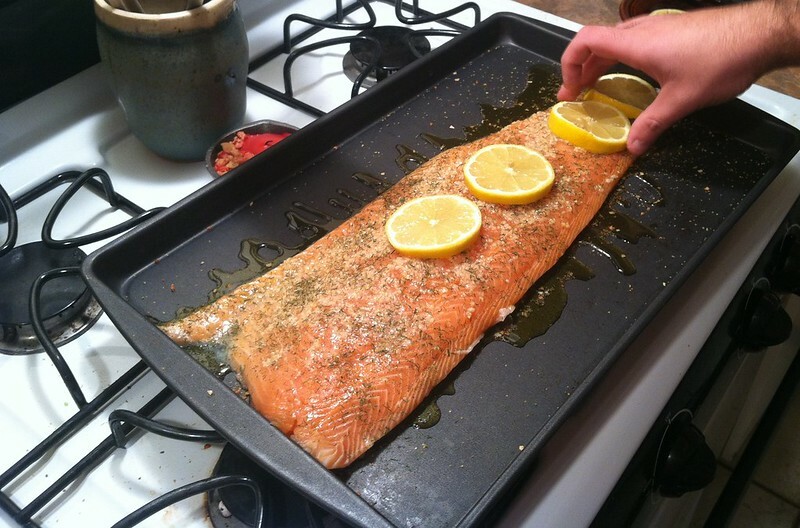 Before he got started, Zach perused some salmon recipes for inspiration then headed to the kitchen. Below I will attempt to give you the amazing recipe, but Mr. Cook here sorta just goes by feeling. It's an art I tell you. Hopefully the pictures with help out with an idea of the measurements! 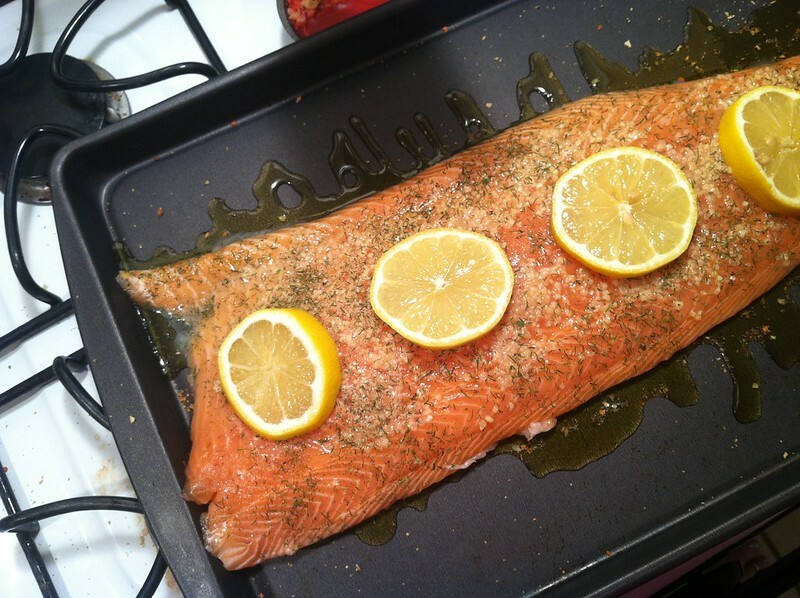 On a sheet of foil long enough to hold & wrap up your filet, drizzle enough Olive Oil to cover where the fish will lay. 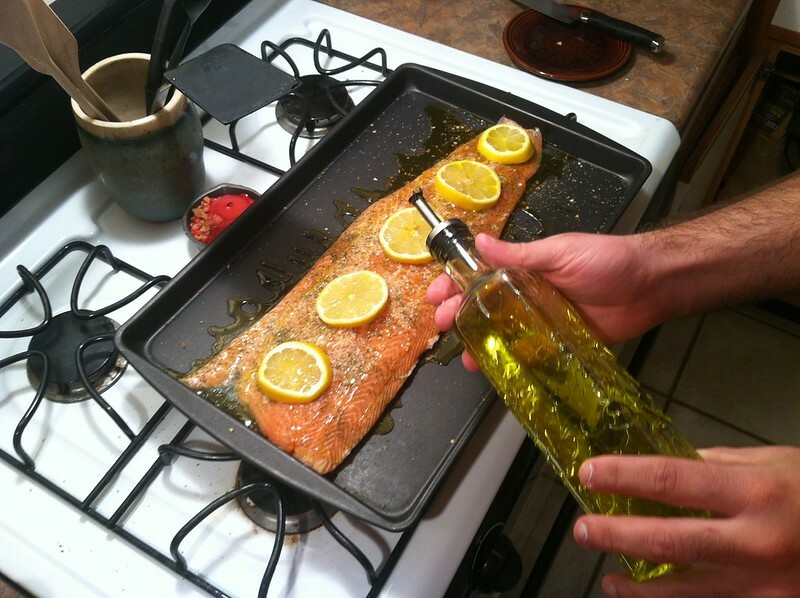 Zach added the Lemon Pepper seasoning on the Olive Oil layer, then placed the fish on top. Spread enough minced garlic for a good (yet thin) layer on top of the fish. Sprinkle on the dill weed covering the top of the fish. Slice your lemon & place slices on top, drizzle with more olive oil. Fold up your foil & place in the fridge to marinade for about 3 hours. After 3 hours, heat your oven to 450 degrees. 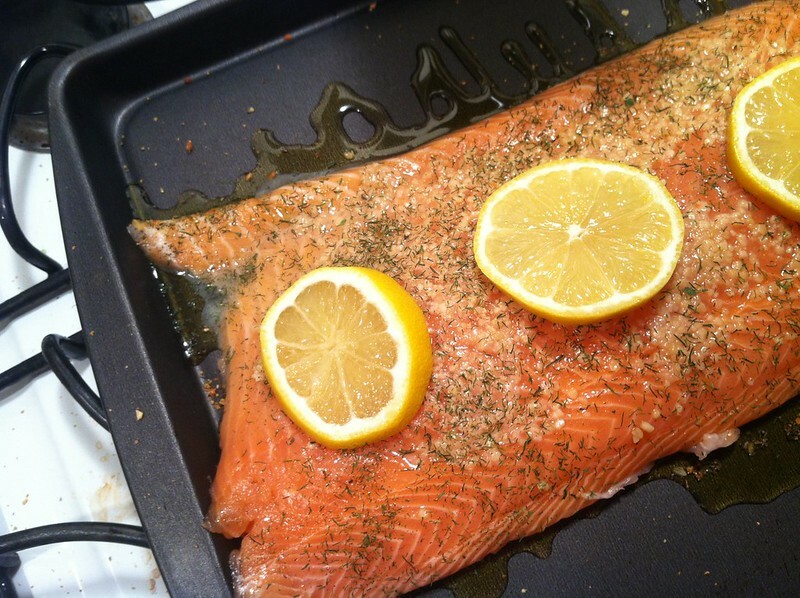 Place the foil on the baking pan & unwrap your fish. Flatten out the foil enough on the pan. (now you don't have to wash your pan!) Place in the oven & bake for 10 minutes. 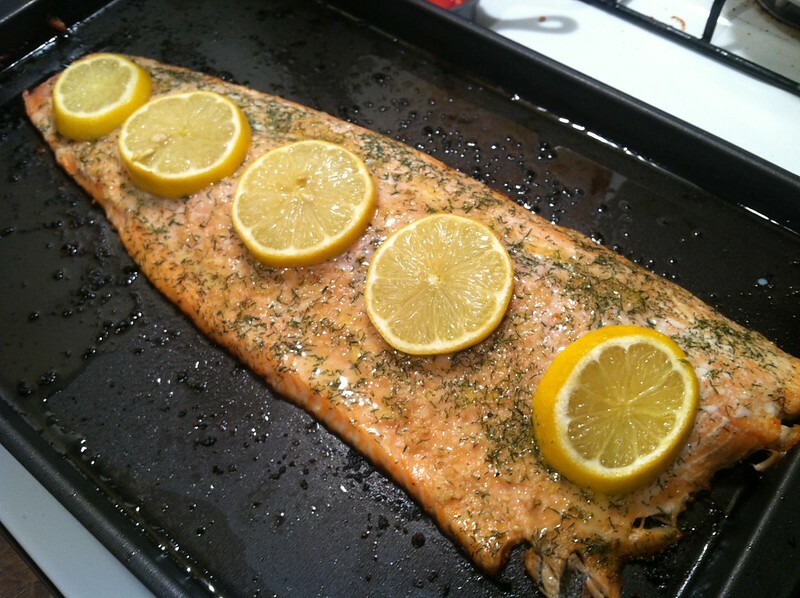 Remove it from the oven after 10 minutes then be prepared to melt because the fish is so delicious. I had my first bite & died it was so yummy. This has to be one of the top 10 things Zach's ever cooke for me. I think the peanut sauced deliciousness & the ravioli we made last Valentine's Day make the list as well! If you have any questions, I'll be sure to ask Zach & see if we can get it sorted out. But man oh man this was the most delicious thing ever! We had it with brussels sprouts & mashed potatoes. I was so happy to have some left over for lunch the next day. Oh myyy.... this looks heavenly. Josh and I need to start cooking more often and staying away from the drive throughs. 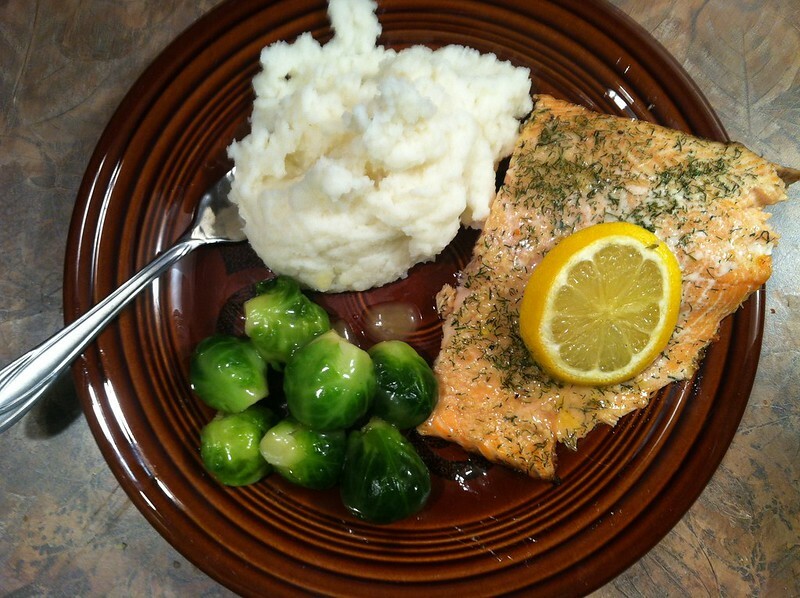 I always thought salmon was pretty simple to cook, just need to break out the lemons and spices!